The lovely Maria Opens Up was 40 this week, a landmark that can’t possibly go unnoticed on the Exposing 40 blog. Those of you who follow Maria on Twitter will know her online moniker is Maria Sibylla and her handle is @MSM1647. What you may not know is that Maria Sibylla Merian, born in 1647, was a talented scientific illustrator who David Attenborough (hero!) regards as one the most important entomologists the world has ever known. Divorced from her husband, she took her daughter to the jungles of Suriname and turned her love of butterflies and insects into her work. In the early 1700s, way before cameras existed and when common belief was that insects were horrid creatures born of mud, she published a beautiful book of paintings that charted the life cycle of the insect world. Today her illustrations are regarded as art and science. What a woman! Oh my gosh! This is so lovely and so thoughtful! Thank you! I discovered Maria Merian while working on a play called ‘Maria’s Metamorphosis’. When I was thinking of a name for this experience, I recalled that experience and her and thought it was all really fitting. I admired her spirit and talent and independence in a time when it wasnt common for a woman to be on her own. I also find her work to be amazingly beautiful. As I do yours, Ms. E40. 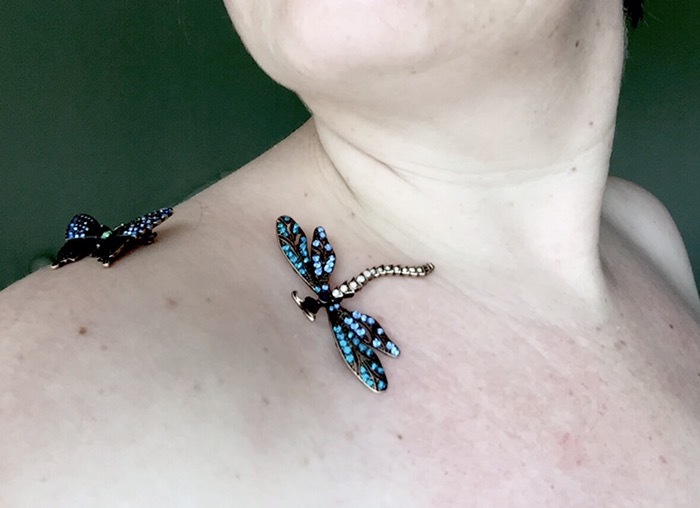 Your skin is absolutely lovely here, and the jeweled insects are delightful. Beautiful and happy birthday to Maria. and welcome to the 40s! Gorgeous image and such a fabulous tribute! I do love an insect they are absolutely fascinating creatures. Beautiful image and wonderful tribute. Lovely post . . . and a lovely photo-tribute!!! Happy birthday! Beautiful image and words. Not only are the colors magnificent and bright, but my hat’s off to you for being able to stay still!! What a truly fabulous tribute! I love the way they shine against your gorgeous pale skin.